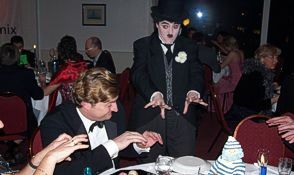 Artisitic, funny, simply unforgettable  the highest quality entertainment for your party or event! Andrea Hardy  a true international performer  brings entertainment of the highest level to any party or event. For years she's entertained her public using her multi-faceted talents with wit, charm and performing expertise. The many different guises of Andrea Hardy are guaranteed to please. Whether in her role as the unforgettable Charlie Chaplin, clowning around as Maxi the Clown  ringleader of the Magic Circus Regensburg  or chilling her audience as Temerarius the Headless, she guarantees the most memorable occasion or event for your public or group. Andrea grew up in the entertainment world and graduated from the National School of the Performing arts in East Berlin. She is a veteran of world-wide shows, events, expos, presentations, television appearances, advertising and stage presentations. Customized to your specific needs and wishes, Andrea brings together her talents and expertise to help you build your perfect event. She understands how to bring the elements together and helps you do the same. Comedy, performances, magic  together to create your individual presentation.